Disporopsis are a small genus of evergreen plant that resemble Solomon’s seal. Disporopsis pernyii is a tall growing form as is Disporopsis aspera while Disporopsis Arisanensis is much shorter. Disporopsis do look a little like an evergreen Solomons Seal, so D. pernyii earns the common name of ‘Blushing Solomons Seal’. Most species have arching stems and white flowers. 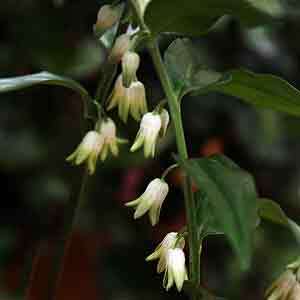 They grow well in dappled shade and will over time spread to form a large clump in these conditions. All Disporpopsis are woodland plants, they are evergreen and are very useful for shaded positions. Simply plant in shade, water in with a liquid seaweed fertiliser and mulch to maintain a cool moist root run. Dappled shade to slightly deeper shade. D. Arisanensis – Low growing with white flowers that have a deep purple inside. Flowers are followed by dark purple berries. D. longifolia – White flowers with a touch of green on the petal tips. Glossy dark folage and will reach around 30 cm in height. D .pernyii – This is a taller growing species with white flowers blushed with pink. Arching stems to around 40 cm in height. A named cultivar D .pernyii ‘Bill Baker’ can be found in the Botanical Gardena in Melbourne in the South China collection. Great for woodland situations and the evergreen nature is very handy. Disporopsis plants are available for sale online from the following growers.